A judgment for over $8 million against an excess liability insurer, representing the damages and interest arising from a $7.6 million settlement paid by the insured without the insurer’s consent, was reversed upon concluding that there was no ambiguity in the policy language requiring the insurer’s consent to the settlement, the U.S. Court of Appeals for the Sixth Circuit ruled in an action stemming from products liability litigation concerning a medical device manufacturer's allegedly defective artificial knee implants (Stryker Corp. v. National Union Fire Insurance Co. of Pittsburgh, PA , November 18, 2016, Cole, R.). Background. In the late 1990s, Stryker Corp. acquired Howmedica Osteonics Corp., a subsidiary of Pfizer, Inc. that manufactured and sold artificial knee joints known as "Uni-Knees." In the early 2000s, several defective Uni-Knees were implanted, exposing Stryker Corp. to several product liability suits. Additionally, Pfizer filed suit against Stryker for indemnification for claims that arose after Stryker purchased the company. The court in that action held that Stryker was required to indemnify Pfizer. Stryker sought coverage under its primary commercial general liability policy from XL Insurance America, Inc. (XL), but XL refused to defend or indemnify Stryker. In 2001, Stryker filed suit against XL. Stryker settled the direct Uni-Knee claims on its own, paying over $7.6 million from its own resources. Following a trial, the lower court found that XL was liable for Stryker’s direct settlements. With respect to the Pfizer indemnification ruling, Stryker tendered the judgment in that case to XL, but XL denied coverage. As a result, Stryker filed a complaint against XL and TIG Insurance Co. (TIG), its excess insurer. XL settled with Pfizer and paid $17 million in settlement of the Pfizer judgment. In doing so, XL exhausted its policy limits—and before it covered the $7.6 settlement. Accordingly, Stryker filed a lawsuit against TIG for the $7.6 million. TIG argued that the terms of the policy required that Stryker obtain written consent when direct settlements were made in order to be covered and, because Stryker failed to get such consent, TIG was not obligated to cover the settlement. The lower court disagreed, finding that there was an ambiguity to the word "claim" in the "ultimate net loss" provision (see Insurance Law Daily’s October 31, 2014 analysis). Thus, the insurer was liable for the damages and interest, which totaled $8.6 million. "Latent" ambiguity. The Sixth Circuit initially determined that the policy clearly limited coverage for settlements only to when the insured had received TIG’s consent. In the absence of any consent given in the present case, the insured’s settlements were not "ultimate net losses" meriting coverage. The appellate court acknowledged that, in some cases, a clearly written instrument may be "latently" ambiguous in light of extrinsic evidence. 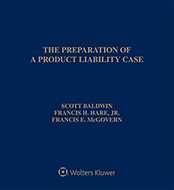 However, in the case at bar, the parol evidence proffered by the insured was insufficient to support the existence of a latent ambiguity. The testimony of former claims adjusters and underwriters, when viewed in a light most favorable to the insurer, showed that the insured needed to obtain the insurer’s consent for settlements that the insurer would pay. Because this evidence did not expose any latent ambiguity, the plain terms of the policy controlled. Moreover, the insured also failed to demonstrate that any of its contract enforcement defenses were valid. Therefore, the lower court’s judgment in favor of the insured was reversed. The case is Nos. 15-1657 and 15-1664. Attorneys: Jeffrey C. Gerish (Plunkett Cooney, PC) and Carlos Del Carpio (Carroll McNulty Kull LLC) for TIG Insurance Co. D. Andrew Portinga (Miller Johnson, PLC) for Howmedica Osteonics Corp. and Stryker Corp.
Companies: Howmedica Osteonics Corp.; Stryker Corp.; National Union Fire Insurance Co. of Pittsburgh, PA; TIG Insurance Co.